Consortium Media + Public Relations has been the PR agency of record for The Collection at RiverPark, Ventura County’s premier lifestyle center for more than three years. CM+PR was asked to plan the exciting 2018 press opening of Southern California’s newest public market The Annex at The Collection. Goals included building traffic, awareness and buzz for the right demographic and geo-targeted consumers from San Francisco to Los Angeles. From 2013-2016, The Collection at RiverPark has established itself as a leading shopping center of Southern California. With the addition of its new public market style space The Annex in the summer of 2017, CM+PR proposed a new marketing communications strategy to effectively launch the new space, its small shops to explore and variety of eateries. 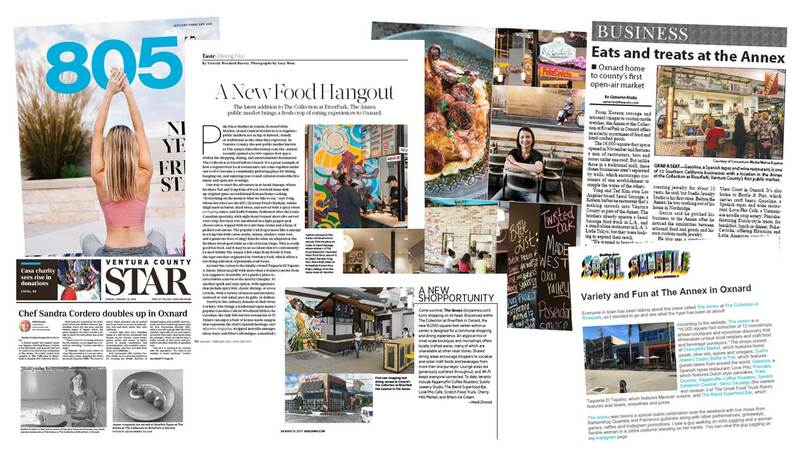 We utilized our list of targeted media outlets covering business, travel and food. At CM+PR’s direction, a visual, informational press book with business owner bios, company overviews and photos was created to include in an impressive, memorable gift box of products on behalf of The Annex tenants as exclusive keepsakes for the press. We worked with client to design The Annex Private hour-long press event for an intimate meet-and-greet and food and beverage tastings with more than 70 of the region’s most influential media representatives in attendance. Our successful and innovative PR strategy garnered $893,863 in Paid Advertising Equivalency and 6,152,250 impressions in local, regional news stories about The Annex. We worked with the incredible Collection team on their short-term goals and delivered long-term sustained general public and media interest well after the opening.